CEPI’s grip on reality always was tenuous at best. Now it seems to have completely lost it. “When I use a word,” said Humpty Dumpty to Alice, “it means just what I choose it to mean – neither more nor less.” Welcome to the Looking-Glass World. Not that of Lewis Carroll’s “Through the Looking-Glass”, but that of the Confederation of European Paper Industries. CEPI represents 800 pulp and paper companies in 18 European countries, producing more than one-quarter of world paper production. 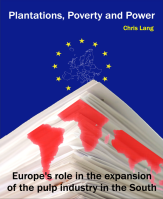 CEPI is, in its own words, “the voice and public face of the pulp and paper industry in Europe, representing its interests towards the European Institutions.” Based in Brussels, CEPI lobbies at EU level aiming to create industry friendly legislation. 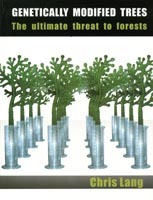 In CEPI’s Looking-Glass World, plantations are forests, monocultures improve biodiversity and logging is good for the forests. 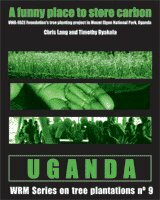 The presentations, of course, had little to do with biodiversity protection. The first presentation came from Hans Verkerk, of the European Forest Institute (EFI). Verkerk looked at how much wood might be removed from Europe’s 29.2 million hectares of protected forests if there were no restrictions on logging. His presentation was based on an EFI study that he had co-authored. The study found that forest protection in Europe resulted in a total of 68 million cubic metres of wood being “unavailable” to the industry. 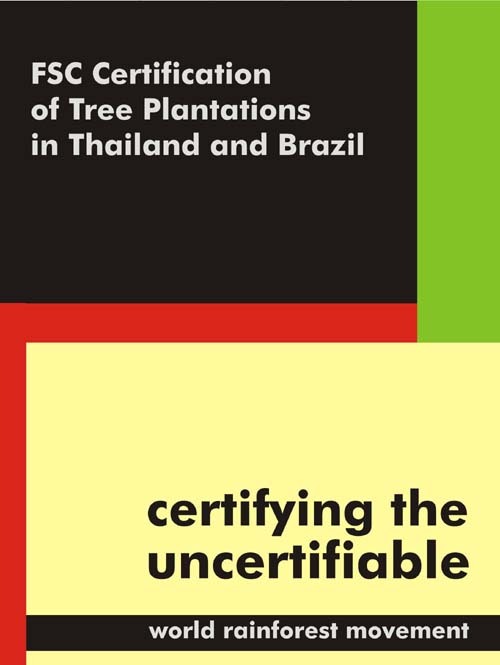 “Forest protection has a clear impact on the availability of wood,” Verkerk noted. Conversely, if the forest is less well protected, the industry would have a lot more wood available. Wisely, given that his study was funded by CEPI, Verkerk did not tell us what the impact of this might be on the biodiversity of the forests. Paula Guimaraes of Grupo Portucel Soporcel followed with a presentation about “Intensive Forestry”. She explained that her company creates a mosaic at the landscape level. She illustrated this with a slide of a scruffy landscape of clearcuts and monocultures. She told us that eucalyptus do no harm to soils and they do not damage water supplies. This may be true in the Looking-Glass World, but has little to do with the reality faced by farmers living near to the pulp industry’s eucalyptus plantations. Papierholz Austria’s Wolfgang Schopfhauser told us about logging mountain forests in Austria to produce bioenergy, mainly for the pulp and paper industry. “Biomass is widely available in the form of standing wood,” Schopfhauser said, presumably referring to the trees that grow on Austria’s mountains. 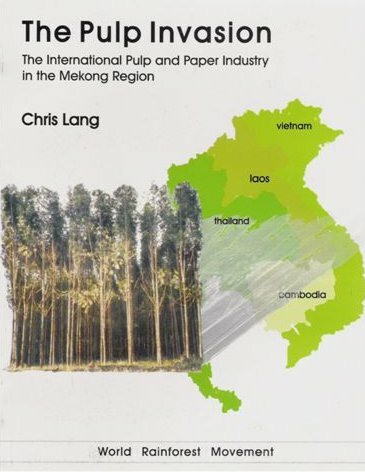 One way of reducing the pulp industry’s impact on the world’s forests is to reduce the consumption (and therefore the production) of paper. This is the aim of the Shrink campaign (see the other articles in this issue of the WRM Bulletin). CEPI responded to the launch of the Shrink campaign by claiming that the pulp and paper industry is “a unique example of how an industry can avoid producing waste and one that recycles at all stages.” Obviously, all that unnecessary packaging and junk mail, all those telephone books that no one uses any more, the mountains of office paper and advertising don’t exist in CEPI’s Looking-Glass World. “By targeting the paper industry these NGOs are promoting other materials that do not have the same environmental credentials,” says Teresa Presas, CEPI’s Managing Director, in CEPI’s response. But the Shrink campaign is not promoting any other materials. It is advocating using less paper in the North, not replacing paper with something else. 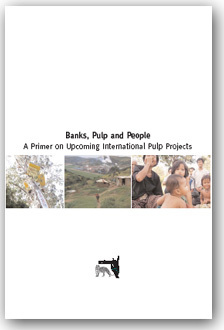 Presas says that NGOs are “contributing to the relocation of paper production to other areas of the world where environmental standards are less of a concern.” She seems to have forgotten that the pulp and paper industry has been expanding in the global South for many years. Stora Enso is a member of CEPI. “Were it not for labour unions at home, we would be moving all of production capacity to countries like Brazil,” a Stora Enso official told the Financial Times in 2005. Last year Stora Enso sold its North American operations to a private equity company called NewPage, which is now closing down mills as fast as it can. Stora Enso is closing two mills in Finland. Meanwhile, the company is expanding its operations in Brazil, Uruguay, China and Laos. In March 2008, 900 women from Via Campesina occupied an area of Stora Enso’s eucalyptus plantations in Brazil, in protest against the expansion of the green desert. The Shrink campaign aims to support this and many other struggles against industrial tree plantations in the South. Presas says that the Shrink campaign would become “responsible for the loss of thousands of jobs in Europe in particular in rural areas.” As CEPI’s own data shows, the pulp and paper industry is responsible for the loss of thousands of jobs in Europe. In 1991, CEPI member countries employed 389,300 people in the pulp and paper sector. By 2006, this figure had shrunk by about a third, to 259,100 people. During the same period, pulp and paper production in Europe has increased. Lewis Carroll (1871) “Through the Looking-Glass”, published by Project Gutenberg, June 2008. “What CEPI does”, CEPI’s website. CEPI’s flyer for the side event in Bonn is available here. Hans Verkerk’s powerpoint presentation at the side event is available here. Pieter J. Verkerk, Giuliana Zanchi and Marcus Lindner (2008) “Impacts of Biological and Landscape Diversity Protection on the Wood Supply in Europe”, European Forest Institute, Technical Report 27. I was at the side event in Bonn. The quotations of presenters at the side event are from my notes taken during the side event. Paula Guimaraes’ powerpoint presentation at the side event is available here. Wolfgang Shopfhauser’s powerpoint presentation at the side event is available here. “Confederation of European Paper Industries (CEPI) Disagrees with ‘Shrink Waste and Recycle’ Campaign by NGOs in Europe”, CEPI Press Release, 12 June 2008. Raymond Colitt (2005) “Brazil is top of the tree in tale that is no pulp fiction”, Financial Times, 21 June 2005, page 20. Vidya Ram (2007) “Stora Enso Finds American Exit Route”, Forbes, 29 September 2007. “NewPage Taking 25,000 Tons of Market-Related Downtime and Shutting Down Niagara, Wisconsin Paper Machines”, New Page press release, 5 June 2008. “Stora Enso to Make Sweeping Capacity, Personnel Cuts”, Paper Age, 25 October 2007. “Women of the Via Campesina occupy area of Stora Enso in the Rio Grande do Sul state”, Via Campesina press release, 4 March 2008. “Key Statistics 2006 European Pulp and Paper Industry”, CEPI, June 2007, page 1. CEPI member countries in 2006: Austria, Belgium, Czech Republic, Finland, France, Germany, Hungary, Italy, Norway, Poland, Portugal, Slovak Republic, Spain, Sweden, Switzerland, The Netherlands, United Kingdom.